I’m not great at film-watching either – requires too much concentration. But I’m finding watching them with a view to reviewing them is making me pay proper attention and I’m enjoying them more as a result. Glad I read your review. I admit I was bored by the film, because I saw it when I was much younger, and hadn’t read the book. So it bored me to tears. 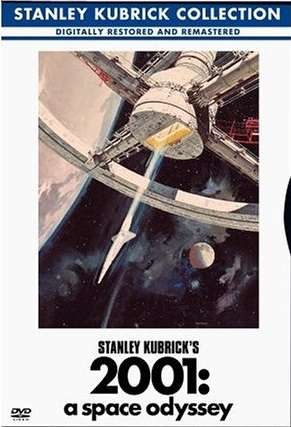 I saw it because it was on the top films list and had been directed by Stanley Kubrick. Perhaps if I had read the book, I would have appreciated it more. Me too – couldn’t get past about the first forty minutes or so. I really wasn’t expecting the book to have such an effect on the experience of watching the film, but it changed me right round from ‘hate it’ to ‘love it’! Now I reckon it’ll be one of those films I watch again and again… and if they ever show it in the cinema, I’ll be lining up for it! Oh, I’m so glad you enjoyed the film more having read the book, FictionFan! I suppose it’s because I really am sensitive to music that I ‘felt’ the sound track right away when I saw the film. It really added to it for me. I didn’t know that Kubrick and Clarke had worked together on the film, but I’m honestly not in the least surprised – at all. I think there’s a solid link between film and book that you see most often when the author of the novel is involved with the film’s production. Well, then. I tried to read the book years ago. And I was not permitted to watch movies. But what I did read did not entice me. Brave up are. FF, You have made me wanted to watch the film once again and read the book for the first time. I’ve not read the book and I’ve only seen bits and pieces of the film. No wonder I was confused and frustrated at everybody else’s opinion that this movie was “Like Wow!” You’ve offered a great solution here, FF — reading the book first, then seeing the film — and I thank you! 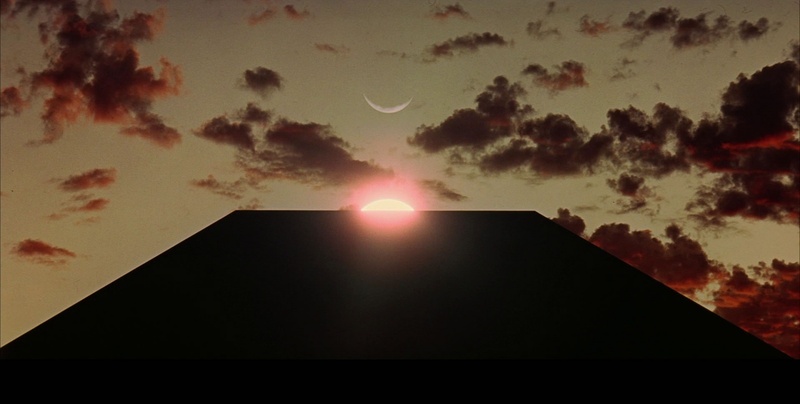 I watched the film at the cinema when it first came out – amazing then. I’ve never read the book – another one to add to the ever-growing list. hmm.. I’m not sure that this isn’t cheating but since I’m unlikely to watch the film (all the way through, although I have seen bits) or read the book… Like you though, I didn’t realise that this was done a simultaneous project which probably makes your conclusion correct! I was lucky to have read the book before I saw the film. 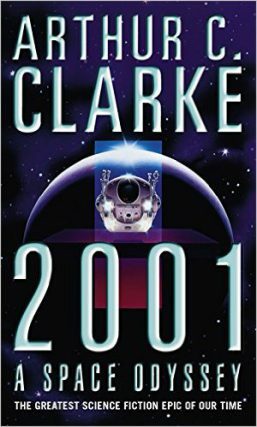 I was a bit of a Clarke “groupie” so I tended to read his books as soon as they hit the library. I don’t think I knew at the time that the book and the film were worked on simultaneously, or jointly, although I think I do remember that there was talk of a film almost as soon as the book hit the stands, which wasn’t so usual then. No, I hadn’t realised they were a joint thing either – a fascinating idea, really, and given the success of it, I wonder why it hasn’t been done more often since. I was amazed at what a difference it made having read the book – the film always bored me because there’s no apparent story in it for ages, but the book filled in the gaps. Great stuff! I don’t watch many of the big sci-fi blockbusters so I’m probably not as used to the better quality effects these days. I thought the effects in this held up well considering their age, and actually looked quite realistic. But it was the psychedelic sequence at the end I loved most – I doubt many directors would have the courage to expect viewers to watch a full ten minutes of basically flashing colours. Great stuff! Yes! Kept seeing the “I’m in!” and “Britexit!” splashed everywhere. I love how the Brits don’t mince their words. The subways don’t say “exit” they say “way out”. I found myself laughing at this for days! (It’s the little things.) Then we hit a breakfast place that had a “Assassinate Donald Trump” fund with a few coins in it. When they heard our voices, they were afraid they’d offended us. But we laughed heartily and I offered them my credit card number… Wonderful country! We loved everything, except the food. How many dishes of fish and chips can one person eat?! I even saw a haggish dish! But lots of international options. We ate Italian mostly. haha. We didn’t see a show, but we covered so much! The kids loved the Tower of London and the stories of the beheadings. The queen passed us on her 90th birthday parade. And we now know enough about Churchill to receive an honorary degree! I now possess many novelties with the British flag… I’m quite happy! After Thursday, depending on how the vote goes, we may have to change all the signs to “Get Out!” Hahaha! Were you surprised by the strength of feeling over here about Donnie the Wig? I haven’t heard one single person saying they hope he gets in. Yes, we’re not noted for our cuisine, but on the upside that makes us pretty open to other people’s – most of us mostly survive on Italian, Chinese or Indian food! But deep-fried sausages in batter have a certain je ne sais quoi, you must admit! SO much I didn’t know, here. And now I’ve got to read a book AND watch a movie to experience this pairing before I die, something that will be life-changing. How can I say no? That is such a unique idea of having the book and movie support each other! It’s really a cool one, though. I’ve wondered about how movies and books theoretically ought to be able to bring out different aspects of a story and shouldn’t necessarily be set up as inherently antagonistic to each other, but I never before realized that someone had actually done it. Nope, nor me, till I went to wiki for help in understanding what it was all supposed to be about. Wiki didn’t exactly answer that question, admittedly, but it did give me a million pages of background info! The book totally changed my view of the film – a strange but great experience! 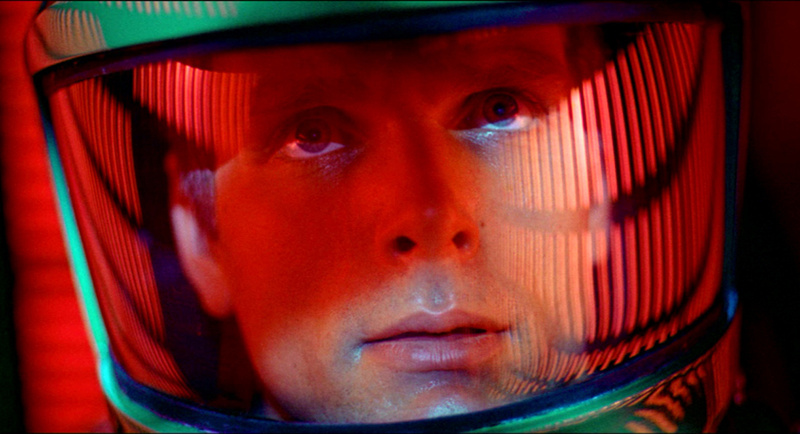 I saw the film on the big screen in my young days, and while I didn’t fully ‘get it’ (except maybe at Kubrick’s inner level of consciousness), I did love it. I was even more open to the allusive in both literature and film then than now. A year or so ago, I saw the film again on the big screen, and it didn’t have the full mind-opening impact for me it had had the first time. It was so new (and I was so young…) then. It’s great to learn that reading the book can open up new levels of engagement with the film: I’ll have to read the book and then see the film again. I’m a bit reluctant to watch the film on less than the big screen though. It is such a larger than life experience. I really wish I had seen it on the big screen – I do think it’s one of those films that would really work better that way. More immersive, and the effects, especially the surreal stuff, must be great. I always have found that books work better for me than either visuals or music – while I enjoy both, I don’t ‘get’ them the same way I get words. So this was an amazing experience for me to see what a huge difference the words in the book made to my appreciation of the film. I wish more authors and directors would get together – not to copy this one, but to try out similar ways of working. Now, what weird music it has. It’s almost like a concert hall sort of thing. And the main theme is odd…but very cool! If I was a man-ape, I think I’d go join Tarzan’s team. In the jungle. Just one of the great effects! If you want to continue the Stanley Kubrick theme, you could compare The Shining film and book. I think the film is great but I haven’t read the book – I’ve heard they’re quite a bit different. What a difference it made reading the book – I’m still amazed at how I went from finding the film a major bore to absolutely loving it! I think the blurb writers for both the book and the film should shout about the fact that they should really be done together! I haven’t read much by King either – I did love his epic fantasy series The Dark Tower though. However I have enjoyed many films based on his work and most recently I loved the TV series 11.22.63. Yes, I was spotting all kinds of stuff that had also turned up in Star Trek and Stargate, and about a million other sci-fi things. In fact, that’s one of the pleasures to me of sci-fi – spotting how they get recycled. It seems to be the one genre where it’s totally accepted to give a new spin on someone else’s story without it being seen as any kind of plagiarism, and I rather like that. I’m still amazed at what a difference reading the book made to my experience of watching the film – you really should try it! Ohhh, makes sense. Maybe next summer we could get Cathy to host 10 books that have been made into movies, and we read/watch/review them. So far, I keep getting way behind on my challenge and then catching up. It’s intense! I also need to plan my fall courses that I’ll be teaching. One of them, remedial English for college students, is be for me. That will cut into my reading! Wow–just finished reading the book–wish I’d read this review before writing one of my own (but since it’s been forever since I’ve seen the movie, It’s mostly about the book. I think I’ll be reading the book more often, though…and maybe someday, when I’m either on Nyquil for a cold or stone-sober and in the mood to absorb (preferably in a movie theater where I can’t escape), then I’ll give the movie an entire run without stopping…I’ll just have to wait til Dad’s out of the house because he hates the movie and turns it off every time I try to watch it. movie’s in the mail (thank you Barnes and Noble! 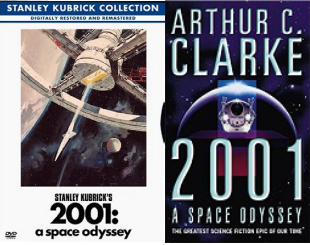 )…along with the other book sequels. I’ve wanted to give this another shot, and the movie’s less than $6 right now, so what the hell? The last splurge of the year on books and movies.